Cookout For The Troop’s ! Jackson Chevrolet and the Connecticut Automotive Retailer’s Association are inviting Connecticut’s Military Member’s and their families to a Cookout on July 15 from 11 am- 4 pm. Jackson Chevrolet is teaming up with the Connecticut Automotive Retailers Association and other Auto Dealers from across the state. All donations will go to the Connecticut National Guard Foundations, Inc. and USO Connecticut. 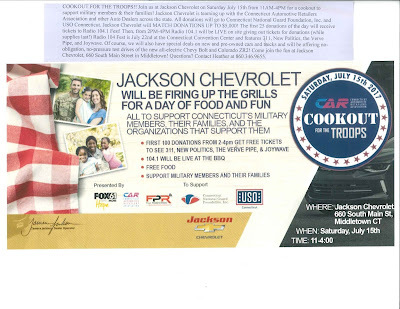 Jackson Chevrolet will match donations up to $5000. The first 25 donations of the day will receive tickets to Radio 104.1 Fest. Then, from 2pm-4pm Radio 104.1 will be Live on site giving out Tickets for Donations, while supplies last. Jackson Chevrolet is located at 660 South Main Street in Middletown CT. Any questions can be directed to Heather at 860-346-9655.